Rich Carreon, principal at Mar Vista High School, will be joining the team of community members contributing regularly to Dig Imperial Beach's wide and varied coverage of news and events going on in and around the community of Imperial Beach. Bryan Brillhart, who does a weekly column on a "Bird of the Week" from our own local Tijuana Estuary. Plus we have a great group of people who contribute regularly and we "Thank" everyone in the community who contributes. 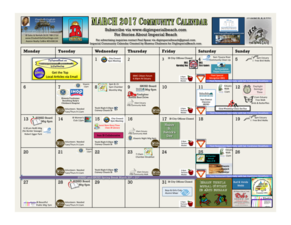 Also be sure to sign up for our free Imperial Beach Community Calendar that comes out at the first of the month with our newsletter. You can click the link to subscribe or email us at DigimerialBeach.com with your name and we will get the Calendar out to you right away.